Sun's Golden Ray Publishing, LLC, 9781945438202, 374pp. For the past three years, Brynna has been patrolling the streets of Forcadel as a masked vigilante, protecting the innocent and beating up bad guys. Her current target is Lord Beswick, a slumlord businessman who keeps the townsfolk in a vicious poverty cycle. But one fateful evening, she's captured by Felix, the captain of the king's guard, and told a shocking truth: her father and brother are dead, and she needs to hang up her mask and become queen. Before long, she negotiates a deal with Felix: attend to her royal duties during the day and continue her vigilante mission to take out Lord Beswick at night---at least until her coronation. But the politics of Forcadel are as volatile as the streets, and Brynna isn't sure whom she can trust in the castle. With two royals dead in less than a month, she must use all her wits to make sure she isn't the third. 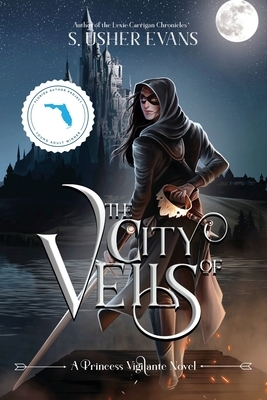 The City of Veils is the first book in the Princess Vigilante trilogy, an epic YA Fantasy from S. Usher Evans, author of the Lexie Carrigan Chronicles, Madion War Trilogy, and Empath. It will be released by Sun's Golden Ray Publishing on April 16, 2019.